This is to inform your email account ([username] @ umich edu) services is currently outdated. Your services to receive and deliver E-messages must be terminated within 12hrs of receipt of this notice. To update and activate your services in full, quickly click below button; if not "you may not be able to send or receive messages at any time from now". 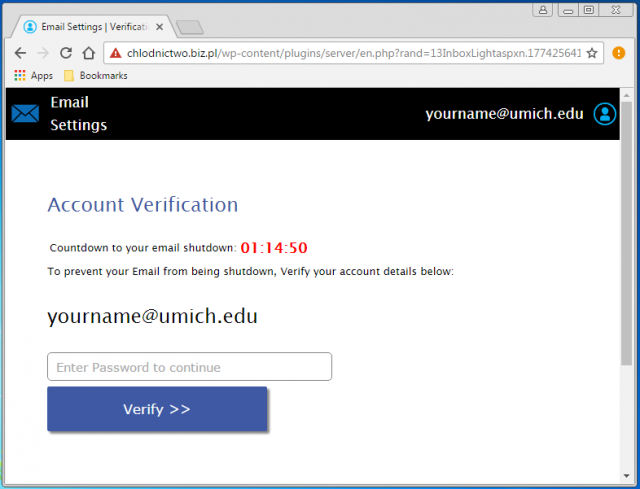 Note: Your account will be permanently disabled if you Fail to verify your mailbox correctly. © 2017 Email Administrator. All Rights Reversed.